Stack up on these easy scoop bowls for fuss free feeding. These easy scoop bowls are designed to make mealtimes easy (and a lot less messy). If mealtime feels like a madhouse, at least you'll be dining in style with a choice of fun colours. The unique easy scoop triangular base makes it easy to scoop up every mouthful, meaning less waste and clearing up. When mealtime's over, they stack inside each other, saving valuable storage space. Safe to use in the microwave, and BPA free, these easy scoop bowls are simple to clean too. Wash with hot soapy water or pop them on the top shelf of your dishwasher. You can even sterilise them for extra reassurance. With a world of flavours and textures to explore, introducing solid foods to your little one should be fun. These easy-scoop bowls are designed to make mealtimes easy and a lot less messy for you. From around 7 months, your baby will enjoy mashed and chunky food and may start to feed themselves. 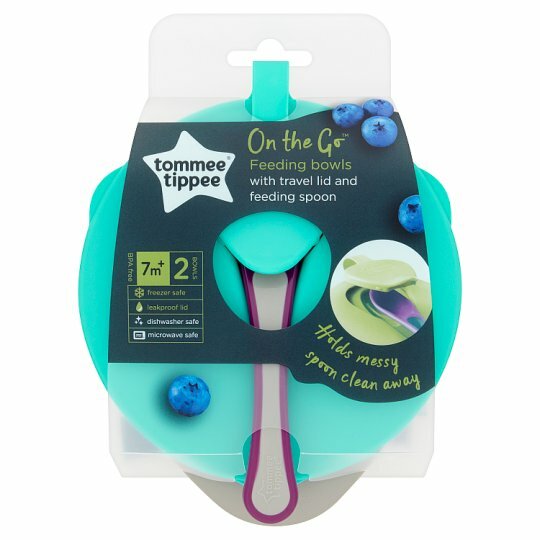 The unique triangular shaped base makes it easy to scoop up every mouthful, making it easy for busy parents or toddlers starting to feed themselves. The bumper pack of four gives you all you need for baby and toddler meals at home or on the go. Tommee Tippee is the number one feeding brand in the UK and one of the fastest growing baby bottle brands in North America. For 50 years, we've made award-winning, innovative products that are designed to make life a little bit easier for parents. And perhaps a little more fun. Today we're honored to be in families' homes in over 50 countries around the world. #ParentOn. Do not store or leave in direct sunlight or near a source of heat., Do not store with or allow to come into contact with solvents or harsh chemicals. For your child's safety and health WARNING! Always use this product with adult supervision. Accidents have occurred when babies have been left alone with feeding equipment due to the baby falling or if the product has disassembled. Before each use, inspect the product. Throw away at the first sign of damage or weakness. Always check food temperature before feeding. Heating in a microwave oven may produce localised high temperatures. Take extra care when microwave heating. Always stir heated food to ensure even heat distribution and test the temperature before serving. Keep all components not in use out of reach of children.